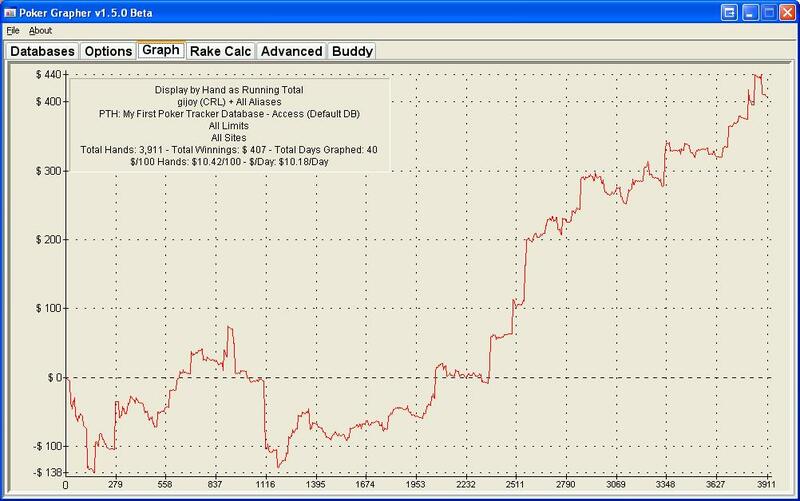 I haven't played much poker in the last 2-3 years, but I'm trying to make a comeback! Though I've been yelling this for almost the same time as I have quit though, this time it will be serious My goal is not to become a high stakes pro but to get a better understanding of the game and be able to destroy the midstakes. Also being a player myself will give me more ideas on useful LP features. - Loose bankroll management, when I know I'm ready skillwise for the next limit I will move up until the amounts get substantial for me. - Bother everyone on my msn list for advice(and LP too of course ). So far I have made a deposit of 1k on sunpoker to get rakeback and also because they got really soft games. To get the basics sharp I started playing 25NL, but played way to agressive and adding a few setups I got dropped to $800 quickly. So I decided to play more standard tight aggressive and opened up a few 50NL tables as well and am able to beat those tables fairly easy. The sample size is really small but I will keep on 50NL for some time. My bankroll is around $1040 now.